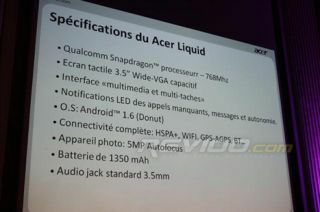 Acer's forthcoming Liquid Android phone was supposed to be the fastest handset in the world, but it appears this now won't be the case. A presentation shows the Qualcomm Snapdragon, which has been traditionally touted as running at 1GHz speeds, clocked at 768MHz. And TalkAndroid has confirmed that this will be the case with Acer, although no reason has been given for such a slowdown. This means the forthcoming Liquid won't be as fast as even the likes of the Samsung Jet or (say it quietly) the Toshiba TG01. However, in our recent hands-on with the phone, the apparent slow down wasn't noticeable - indeed, in our brief tests we struggled to find anything to make the phone judder to a halt. The slide also confirmed the phone will have a 1350mAh battery, as well as running Android 1.6 rather than 2.0. Either way, we're saddened that this is the case - and now we'll have to wait until the Sony Ericsson Xperia X10 to get our hands on a 1GHz Android device.